In almost four decades after the federal education law called Title IX opened the door for girls to participate in high school and college athletics, a crucial question has remained unanswered: Do sports make a long-term difference in a woman’s life? A large body of research shows that sports are associated with all sorts of benefits, like lower teenage pregnancy rates, better grades and higher self-esteem. But until now, no one has determined whether those improvements are a direct result of athletic participation. It may be that the type of girl who is attracted to sports already has the social, personal and physical qualities — like ambition, strength and supportive parents — that will help her succeed in life. Now, separate studies from two economists offer some answers, providing the strongest evidence yet that team sports can result in lifelong improvements to educational, work and health prospects. At a time when the first lady, Michelle Obama, has begun a nationwide campaign to improve schoolchildren’s health, the lessons from Title IX show that school-based fitness efforts can have lasting effects. Title IX of the Education Amendments of 1972 required schools and colleges receiving federal money to provide the same opportunities for girls as they did for boys. Relatively few students, male or female, participate in intercollegiate sports. But the effects in high school were remarkable. 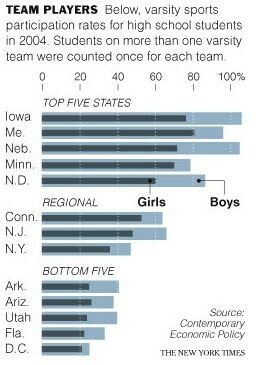 Just six years after the enactment of Title IX, the percentage of girls playing team sports had jumped sixfold, to 25 percent from about 4 percent. Most research on Title IX has looked at national trends in girls’ sports. Betsey Stevenson, an economist at the Wharton School of the University of Pennsylvania, has taken it a step further, focusing on state-by-state variations. States with large boys’ sports programs had to make bigger changes to achieve parity than states with smaller programs. Looking at the state-by-state statistics allowed Dr. Stevenson to narrow her focus, comparing differences in sports participation with differences in women’s educational and work achievement. So her study untangles the effects of sports participation from other confounding factors — school size, climate, social and personal differences among athletes — and comes far closer to determining a cause and effect relationship between high school sports participation and achievement later in life. Using a complex analysis, Dr. Stevenson showed that increasing girls’ sports participation had a direct effect on women’s education and employment. She found that the changes set in motion by Title IX explained about 20 percent of the increase in women’s education and about 40 percent of the rise in employment for 25-to-34-year-old women. Another question is whether Title IX has made a difference in women’s long-term health. In a carefully conducted study, Robert Kaestner, an economics professor at the University of Illinois at Chicago, compared rates of obesity and physical activity of women who had been in high school in the 1970s — as Title IX was taking effect — with similar women from earlier years. Controlling the results for other influences, like age and changing diets, Dr. Kaestner was able to tease out the effects Title IX had on women’s health. He found that the increase in girls’ athletic participation caused by Title IX was associated with a 7 percent lower risk of obesity 20 to 25 years later, when women were in their late 30s and early 40s. His article was published this month in the journal Evaluation Review. Dr. Kaestner notes that while a 7 percent decline in obesity is modest, no other public health program can claim similar success. And other studies have shown that even a small drop in weight can lower risk for diabetes and other health problems. There is still room for improvement. Today about 1 in 3 high school girls play sports, compared with about half of all boys. And participation varies widely by state, according to Dr. Stevenson’s research. Southern states like Alabama, Louisiana and Tennessee still have big gender gaps, while Northern states like Maine, Minnesota, New Hampshire, Pennsylvania and Vermont are closer to parity.